I’m a bit of an occult nerd, or would you say magical tradition fangirl? However, I’ve always been far more interested in the magic practitioner than their magical practices. I don’t know why that is, but that is just the simple truth. A perfect example of this would be, for most “The Golden Dawn” by Israel Regardie would be the first Regardie book to spring to mind. Perhaps the one that defines Regardie for them. For me, my favorite Regardie is “Crowley’s Apprentice: The Life and Ideas of Israel Regardie” by Gerald Suster. That’s not to put down, or belittle Regardie’s own writings in any way, I just found reading about the man himself far more intriguing than reading his work. I had read both “Applied Magic” and “Psychic Self-Defense” by Dion Fortune and as per usual was getting ready to move on to the next thing. This was years ago, back when I first got my fangirl crush on Regardie, and still thought I would miraculously stumble across THE BOOK that would finally get me to settle down and study one spirituality or magical system. Anyway, Fortune was about to be shelved when I learned about a book called “The Magical Battle of Britain”. 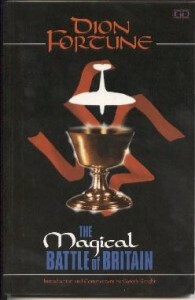 It turned out that immediately following Germany’s invasion of Poland, which resulted in Britain’s declaration of war, Dion Fortune began a series of letters to members of her magical order, The Society of Inner Light, initiating a magical operation designed to stop the Third Reich. Those letters ended up being put together into a book…..”The Magical Battle of Britain”. As someone more interested in practitioner than practice I was thrilled. To get to read letters outlining Dion Fortune’s magical call to arms? Her instructions on how to do battle? For reals yo? I was bouncing off the walls with excitement, which then turned to banging my head against the wall in frustration to learn that the book was out of print. Of course I’m a lucky lady with a wonderful husband and so I was surprised with a very good condition used copy of “The Magical Battle of Britain” as a gift at some gift giving occasion not too long after learning of the book’s existence. It has been a cherished possession ever since. 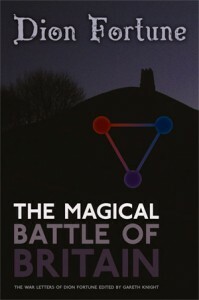 It offers a unique perspective on the war, magical practices, and most important to me, different glimpse at Dion Fortune. So why am I telling you all of this? Because I am THRILLED to say that thanks to Skylight Press “The Magical Battle of Britain” is back in print! This book has really meant a lot to me and when I learned they were re-issuing it I knew I had to let you guys know about it. There’s just truly no other book like it, featuring Fortune or any other notable magical practitioner. If you’re interested in magical practices, I feel this book is a must own. It’s too cool not to have on the book shelf.